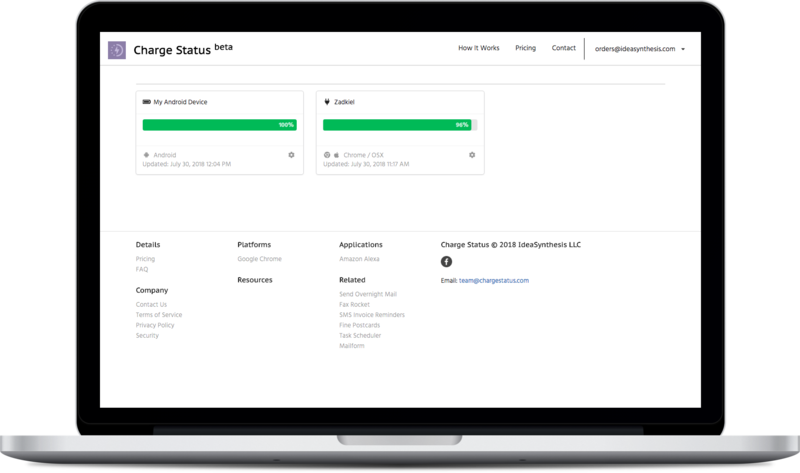 Charge Status is the easiest way to monitor the charging status and battery level on your computer or mobile device. Clearly indicates the charge status of all your connected devices. Audible alarms (configurable) on low or critical battery levels. Push notifications on Chrome, Firefox and Safari that alert you when a battery level drops below your configured critical levels. Works in mobile browsers out of the box, including push notifications on Android Chrome. Audible alarms directly configured in the Chrome Extension: no account needed. 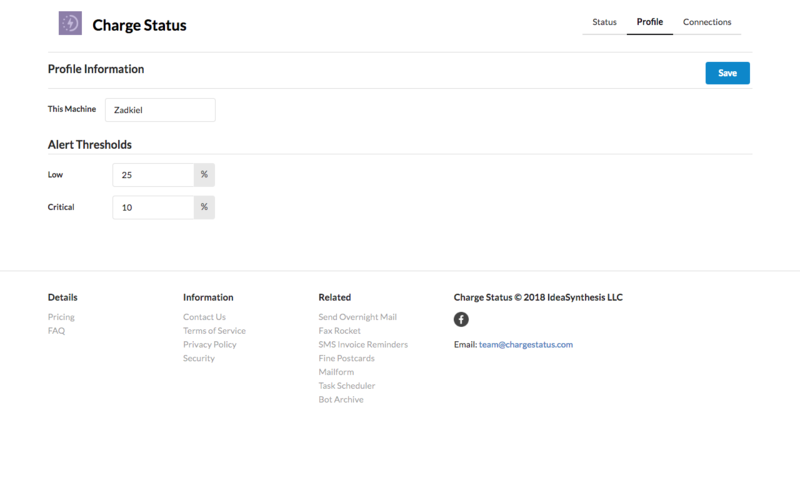 One-click connection to your online Charge Status account. Connect multiple devices to your Charge Status account to track them all in a single place. Simple charge meters allow easy visualization of charging status and battery level. Easily see how long until the battery is fully charged (where supported). Chrome extension for Chromebooks and the Chrome browser: easily track the charge status of your computers running Chrome and your Chromebooks. Support for Amazon Alexa: talk to Charge Status, ask it whether or not your phone is charging and what the battery level is. Support for Google Assistant: talk to Charge Status, get a report on the battery level on all your devices. We were inspired to build Charge Status after a stretch of time when every time we tried to use a specific tablet the battery was dead because we'd forgotten to plug it in. We wanted to solve this once and for all: we have the techology! Our solution was this: a simple install process, a clean dashboard that lists all your devices, tells you whether or not they are plugged in and what the current battery level is, and sends you a notification when the battery on any of your devices drops below a simple threshold.